We have been developing our natural gas pipeline network to ensure long-term stable gas supply in line with growing demand for city gas and the expansion of our service area. 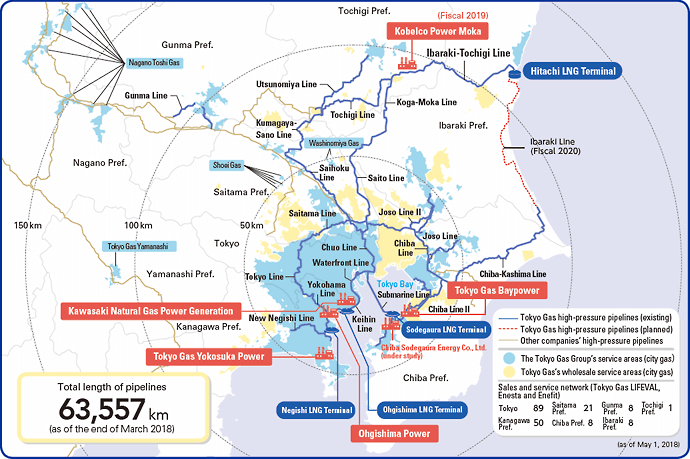 To accomplish its FY2018–2020 medium-term management plan GPS2020, Tokyo Gas is efficiently building up its gas pipeline network and working to ensure the stable supply of gas for a rise in the total number of customers, including household users, thanks to the potential growth in demand primarily from industrial users in the Kanto region. In the course of developing our high-pressure pipeline network, we completed the Saito Line in October 2015, the Ibaraki-Tochigi Line in March 2016 and the Koga-Moka Line in October 2017, and we connected the Hitachi LNG Terminal with our three other LNG terminals on Tokyo Bay, improving supply stability mainly in the northern Kanto region. We started the construction of the Ibaraki Line in fiscal 2017 to improve supply stability and expand transmission capacity through a looped network of high-pressure trunk lines. The construction work is continuing toward completion in fiscal 2020. In fiscal 2018, we continued working to ensure stable supply, through such steps as conducting tighter inspections of key supply facilities, such as high-pressure pipelines, key medium-pressure lines and facilities for receiving gas from other companies and strengthening our emergency backup system and conducting emergency drills. 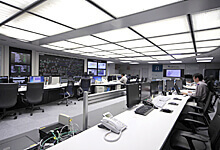 The Supply Control Center centrally monitors and controls the operational status of city gas production and supply facilities in the Tokyo metropolitan area, 24 hours a day and 365 days a year. It accurately guides the adjustment of gas output at LNG terminals, pressure at governor stations and storage and withdrawal at gas holders to ensure the stable transmission of city gas in the context of regular checkups and maintenance work at LNG terminals and on high-pressure trunk lines. In the event of a natural disaster, the center collects information, assesses the extent of the damage and handles first-response work for preventing secondary disasters, such as a suspension of gas supply. In cooperation with the Cabinet Office and Tokyo Metropolitan Government, it works to prevent the damage from worsening by sharing information through dedicated communications terminals and discussing responses through teleconferencing. We operate the Transportation Service Center, which was opened in response to Japan’s complete liberalization of its retail gas market. The center helps new entrants operate smoothly, receiving their applications to use our gas pipelines for consignment supply and setting up a billing system for after the start of the service. We treat all gas retailers fairly and maintain neutrality by physically isolating the center’s relevant office to ensure appropriate management of information on gas retailers and banning the use of information related to the service for other purposes. We are accelerating efforts to ensure the safety of gas pipes, including adequately upgrading and improving equipment such as aging cast-iron pipes and other old pipes. Each of our pipeline network centers in charge of gas pipelines works out and properly implements annual plans for examination and inspections as well as replacement and upgrading in light of priorities. House (galvanized) pipes at customer sites are subject to corrosion underground. We are proceeding to replace them with polyethylene or other corrosion-free pipes. We explain to individual customers the need to replace house pipes at buildings requiring high security and carry out upgrading work on request. For other buildings, we inform customers of our replacement initiative during such occasions as regular checkups and conduct the necessary work on request. In accordance with the Gas Business Act, we conduct regular gas leakage checks for the early detection of gas leaks on streets and immediately perform repairs at the identified sites. We follow regulatory and administrative guidelines and notices whenever we plan, conduct and manage a regular checkup. Besides the legally mandated regular checkups, we plan and constantly carry out our own gas leakage inspections in order to build customer confidence in our services. High-pressure gas trunk lines are the arteries for transmitting city gas from our four LNG terminals to the Tokyo metropolitan area and the rest of the Kanto region. We go to great lengths to ensure the safe transmission of city gas and use the latest equipment for maintaining and managing these trunk lines. One important effort is to patrol these lines. During the patrols, we check whether other companies carry out construction work without asking Tokyo Gas in advance about the locations of nearby gas pipes. 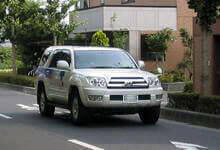 Also, we watch for any road damage such as cracks or depressions that may affect gas pipes. The patrols also include inspecting gas supply equipment and confirming that pressure regulators that adjust gas pressure and valves which shut off gas flows operate without vibration or noise. Daily patrols for these extensive inspections ensure operation safety. As a gas supplier, we must maintain basic and expert knowledge and technologies associated with gas, supply equipment and gas appliances at a more thorough level than anyone else to support customers in the safe use of gas. We intend to create and refine a system for developing and passing on basic technologies that are indispensable for customer safety and security. In developing our expertise, we focus our research and development on technologies related to combustion, heat transfer and fluid analysis, which are required for the highly efficient and safe use of gas; technologies for assessing materials and seismic capacity required for the safety of infrastructure, such as pipeline networks; and gas analysis technologies for maintaining the high quality of the gas supplied to customers. In the event of an accident caused by a natural disaster or faulty gas appliances, engineers specialized in relevant fields respond quickly to investigate the cause and take necessary measures to prevent the recurrence of a similar accident or equipment failure. We work to develop and improve methods for pipeline construction, maintenance and management to continually improve the safety and performance of pipeline construction work. As an industry pioneer, we will contribute to improving the safety of gas pipelines and develop the entire gas industry by introducing the fruits of our efforts to other gas utilities. We conduct research and development on ways to protect pipelines and other gas supply infrastructure from earthquakes and other disasters so customers can use gas safely. Testing with the aid of a 3D shaking table, which simulates ground motions from an earthquake as strong as the 7.3-magnitude Great Hanshin-Awaji Earthquake in 1995, allows us to assess the safety of various items of equipment that comprise the gas supply infrastructure. We use numerical analysis simulation, which simulates real-world phenomena on computers, to conduct seismic performance assessments that take into account the complex movement of underground pipelines. The results of the research have been applied to our own measures to protect the gas supply infrastructure against earthquakes as well as similar efforts across the entire gas industry. Looking ahead, we will continue conducting research to strengthen the earthquake resistance of the gas industry as a whole.